Indian attack on U.S. soldiers, who are barricaded within a hole or depression in the ground. In this richly detailed, panoramic scene, four soldiers and six Indian men are depicted. The Indians are armed with feathered lances and rifles, and two of the warriors wear long, feathered war bonnets. The label at bottom right reads, “A heavy battle in which more white than Indians killed. 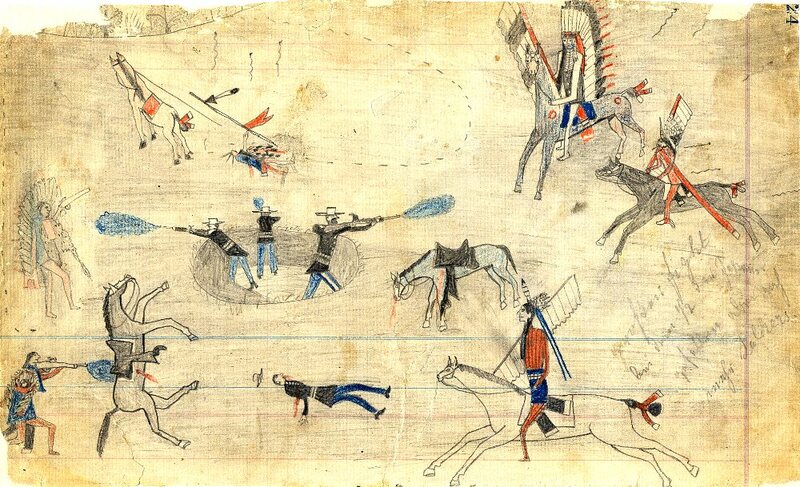 Soldiers in hole.” and “Fight where half Indians killed.” Based on the position of the soldiers as well as their uniforms, archeologist Brett Cruse of the Texas Historical Commission believes this scene may depict the Buffalo Wallow battle in 1874, one of several clashes between Southern Plains Indians and the U.S. Army during the Red River War. There are few reported accounts of battles where soldiers have fought from a defensive position dug in within a hole. An unusual element in this drawing is the suggestion of a wooded landscape in the top left corner. Trees, plants, and geographic features are rarely included in ledger art. TARL Archives.